A member of the firm negotiated an 18 year sale/leaseback for the CIBA Vision (now Novartis) Corporate Headquarters. The property is comprised of five, one to four story buildings containing an aggregate of 695,943 sq. ft. 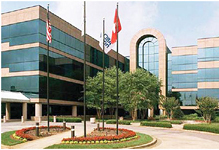 The property was constructed in phases between 1989 and 1997 and is located at 11460 Johns Creek Parkway, Duluth, Georgia in the Northeast Atlanta market.